Robert Zend memorialized in Toronto! ​Robert Zend Lane was unveiled on May 3, 2016. Robert Zend Lane runs South from Benson Avenue between Greensides and Arlington. Grandson Robert Zend (Jr.) and daughter Natalie Zend unveil the street sign as friends Giuliana Katz, Claire Lavigna and Wynton Semple look on. "I felt inspired to create an interactive performance art piece - Zend-style on the eve of the Zend Lane unveiling. Before leaving my studio I grabbed a blackboard chalk tag (that I just got from the dollar store) and a piece of white chalk and raced off on my bike to Zend Lane in the heart of Zendland. I had no idea what I would do with it. After the lane unveiling, we were all invited to the Zend house with Natalie and Janine leading the way. Guests gathered in different rooms in the Zend house which were set up with exhibits, reading circles and art. As I made my way around the house speaking to people I found myself interested in experiencing their Zend-Perspective… so I pulled out the small tag and my chalk and asked them to create something - a word/image that is Zend-like. This performance art piece was received well, as everyone had poems and moments to share that they were re-living, living and experiencing in the present moment. The TAG gave them somewhere to express and a moment to do it at the party. I’d like to thank the Zend family and all those who participated sharing their love of Robert Zend and his works." 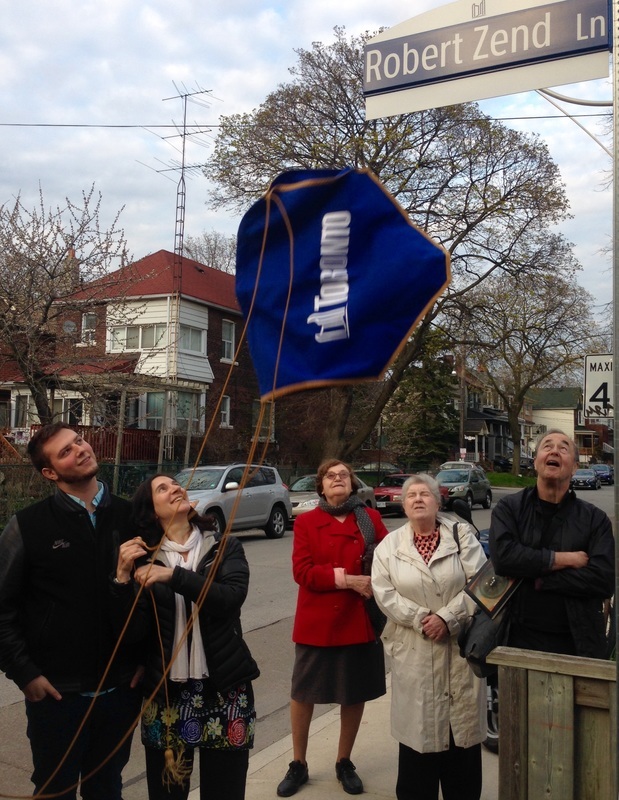 About sixty people gathered to take part in the City of Toronto’s dedication of an overlooked and hitherto-unnamed laneway that meets Benton Street, south of St. Clair Avenue and west of Christie Street. At 7:00 p.m., on May 3, 2016, it was named to honour the memory of the poet and artist Robert Zend, who had lived in the district for almost two decades. Those who foregathered were largely Bohemian survivors of the 1950s, former hippies, lost-looking yippies, members of Generation X, as well as the Millennial Generation, and vaguely arty looking singers, songwriters, dancers, scribblers, and dabblers, etc. I am not quite sure where I fitted in, nor Robert Priest, who was also in attendance. Priest is the very talented, energetic, and able writer blessed with a flashing rapier wit. “Do you have to be dead to deserve this honour?” he mused. “That could be your lane,” he said. ​With that the speakers for the occasion began to praise Robert Zend who was not here to take the bows and relish the encomium. How much he would have enjoyed it – and joined in. "Anonymous lanes transformed into celebrations of local lore." New names for nine previously anonymous laneways in the St. Clair Ave. W. area will be dedicated in the spring. A 10th, "Dom's Lane," will be unveiled in a ceremony Saturday. With more than 3000 lanes in the city, emergency services such as fire and ambulance prefer that lanes have names so they're easier to find, said local councillor Joe Mihevc. Very often, if there's an accident in a laneway...they don't know, if you refer them to the front of the building," the Ward 21 councillor explained. This round of naming marks the first time the neighbourhood has properly laid claim to any of the more than 100 lanes that clandestinely criss-cross behind houses and shops, connecting playgrounds and parking spots. Twenty-five suggestions were submitted for review by a group of local residents, with an eye out for namesakes that would make a broad impact. The names must also comply with the city's policies for street names, so no offensive language allowed. Despite the strong response, Mihevc said naming every lane isn't the goal. Robert Zend fled Hungary in 1956 with his wife and baby and soon established himself among Canada's literary luminaries. For 21 years he and wife Janine lived on Hillcrest. In almost 20 years of work for the CBC, Zend held many positions. He published five books of fiction and poetry in his lifetime. Janine published five additional volumes after his death in 1985. A shorter version of the article is available here.